Freeform Calculator is exactly that. It's free; it's freeform - insofar that it doesn't have a particular form; it's like a tape calculator that performs most of the normal types of calculation that most people require. It's designed for phones and tablets and also works in any browser on a PC or Mac. Freeform Calculator works using the same conventions as Excel: multiplication and division occur first, addition and subtraction second. Using brackets ensures certain things are grouped for calculation. It doesn't do scientific calculations or trigonometry or raising numbers to powers, but it does do simple things a whole lot easier and with less fuss than Excel. Pass The Bill is another calculator. This uses the same engine as Freeform Calculator but is specifically designed for phones and tablets to split bills and share them fairly when you're eating with with friends. Using Pass The Bill on a phone or tablet in a restaurant will remove the stress that often happens when a bill is presented and friends want to pay just for their fair share of the bill. You can calculate what each person should pay based on their individual items and on the items they shared with others. Then you can add tips based on those amounts. It was a difficult decision whether to call this app "pass the bill" or "parse the bill". Search engines could mistake pass for parse or vice versa, but the word parse has a meaning that properly describes the process as being a separation of the parts into distinct sections - text and numbers. 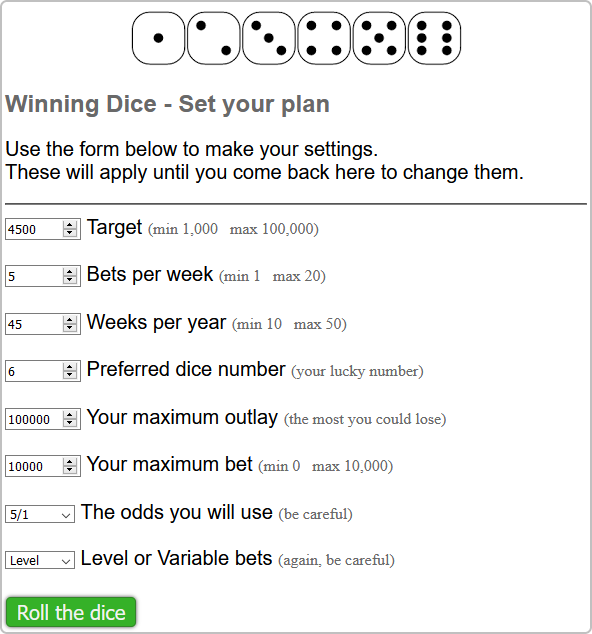 Winning Dice was an experimental project to see what happens if a gambler plans to make a certain amount of money and increases the bets each time to cover previous losses. 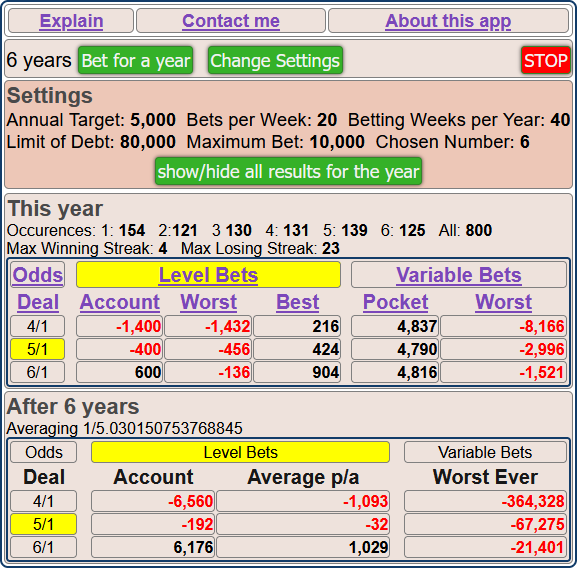 Rolling a dice is easy to understand and the true odds of rolling any number are very easy calculate - it&apos;s got 6 sides and they all have the same chance of being on top, so that&apos;s like 1 to 5 (once for your number and five times for the other numbers). It was quite an eye-opener to see how easy it is to lose a fortune when your number waits a long time before showing.